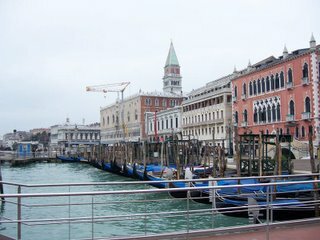 Here is a view out the dining room window of our hotel showing the gondolas all lined up and ready to embark passengers. 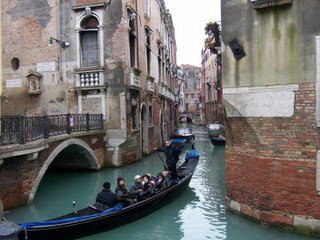 A couple of more pics showing a canal near our hotel and gondolas in action. 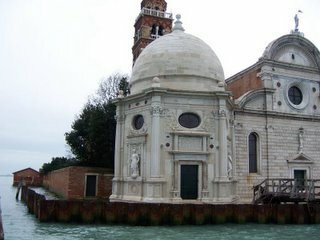 The hotel clerk offered us a free watertaxi to Murano Island to see the glass makers. We would see how they blow the glass and then tour their show rooms. 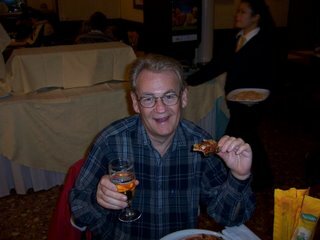 Both Randy and I have always been interested in Murano glass so we are looking forward to this trip. 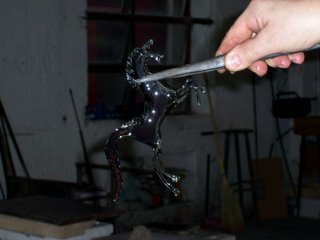 These next pics show a glassblower in action. He made a small horse in about two minutes flat. I couldn’t believe my eyes. Plus this guy was not even a master yet. 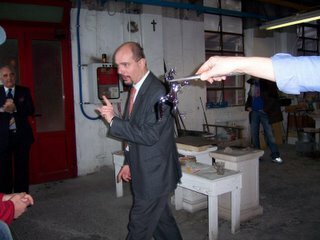 Unfortunately the Murano factory had sales people hounding you after the demonstration. They took you into the showrooms where all their works are displayed. They are very beautiful, but also very expensive. There was hardly any piece under 1,000 Euros. 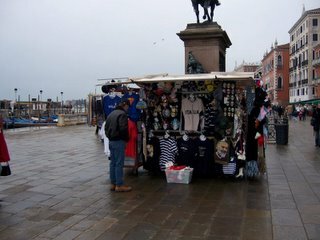 Most had prices on them and they were willing to bargain but they were too forceful and wanted you to buy right now. Needless to say we bought nothing from them. They did give us a free watertaxi ticket to get back. 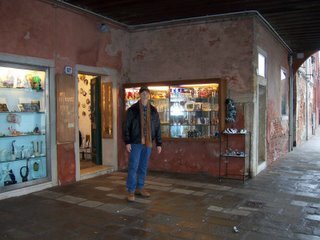 Here is Randy in front of a Murano glass shop waiting for our watertaxi. 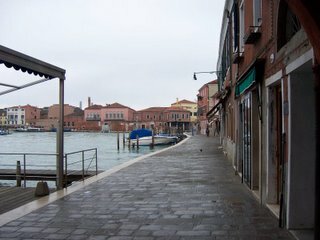 Another pic of other glass factories on Murano Island. 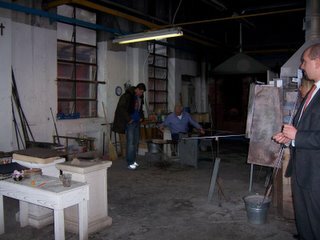 The glass blowers do not normally work on Sunday so the place looked pretty bare. A picture taken from the watertaxi showing what I believe is St George Island. 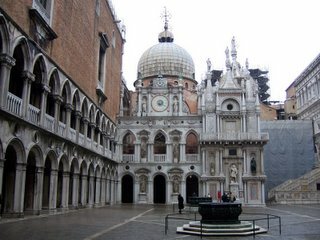 Someone said this is their cemetary for those that die in Venice. This is our watertaxi stop where we got off. 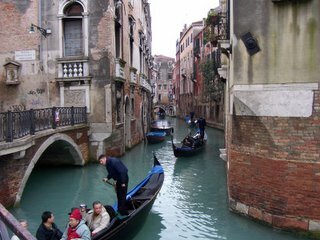 It shows more gondolas rarin’ to go. 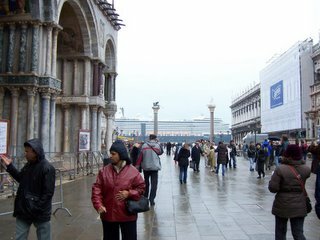 In the past the gondolas used to be brightly painted in multiple colors. 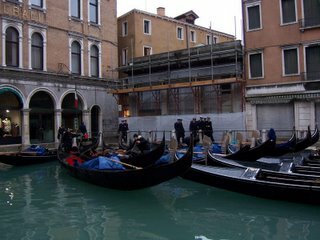 Then the city fathers issued a law stating that all gondolas must be black. Seems like they are going back in time. Weren’t all the Model T’s black? Now we have multiple colors. DUH!!! 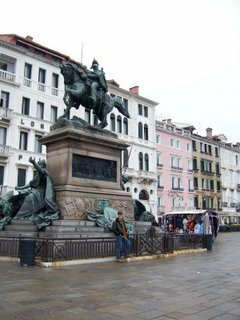 Randy standing under some statue. Not sure who it is. 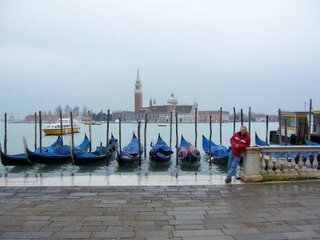 Then myself in from of a line of gondolas. Randy looking for a bargain? I doubt if you will find one there. 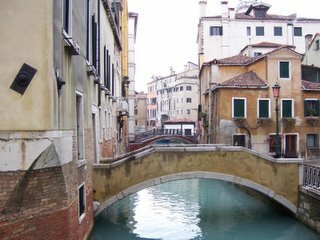 This is the famous “Bridge of Sighs”. 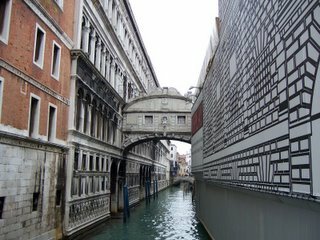 This is the last bridge that prisoners would go over after getting the royal treatment in the Doge Palace. There destination is the cold, dank prisons on the other side. Not a pleasant future once you get in there. A Holland Cruise Line was going through maybe to another port. It seemed huge compared to any of the other boats in the water. 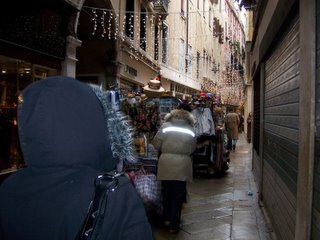 People pushing clothes carts in the narrow streets of Venice. 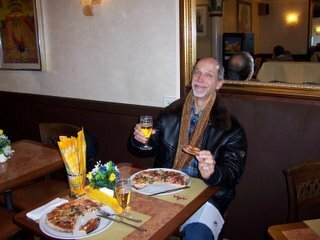 Randy and I eating pizza for lunch. We were famished!!!!!!! YUM!!! YUM!!! 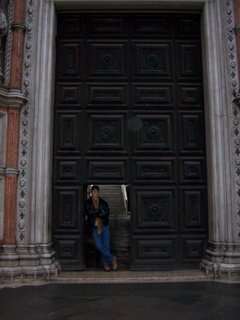 Another shot of the Basilica. 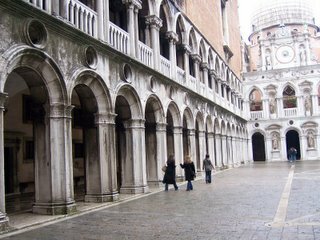 Several shots taken in the open square of Doge Palace. 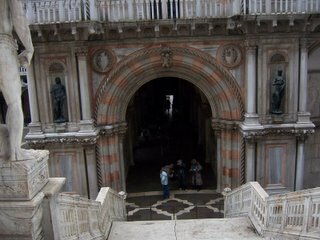 The doge was the Venetian ruler who lived in this palace the entire time of his rule. He would meet with other bigwig Venetions and make the law of the land. 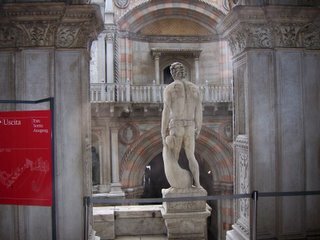 It was a very big and beautiful palace yet the rooms did not have any furniture in them to show you how the doge really lived. I was only able to get a few pictures before someone yelled at me to not take any more pictures. BLAH!!!!! 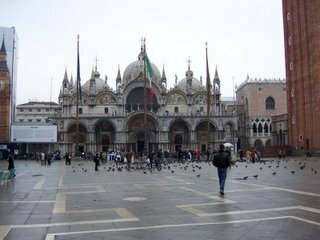 The first pic is outside the doge palace and the others are in the square. 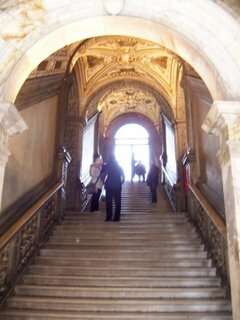 This is the golden staircase leading to the second floor doge private rooms where he lived. 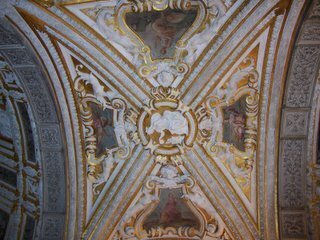 A picture of the beautiful frescoes painted on the ceiling in the middle of the golden staircase. 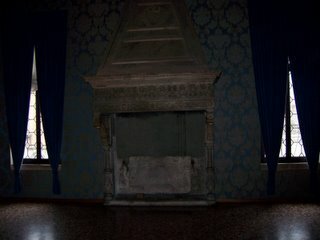 Also one of the doge fireplaces. 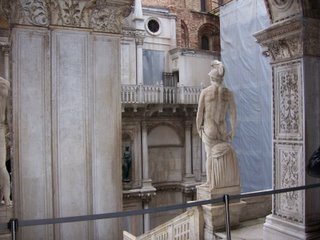 Some pics on the doge balcony looking over the courtyard. Those doges were dirty old men. They liked everybody naked all the time. 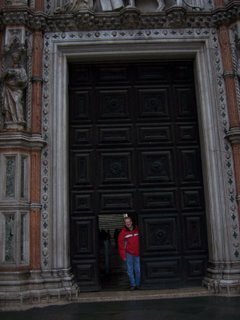 Randy and I playing “doge for a day” at the entrance to the doge palace. 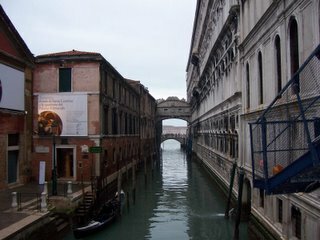 Another view of the Bridge of Sighs from the other side. 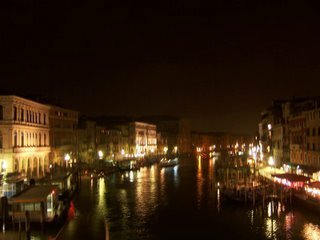 A view of the Grand Canal from the Rialto Bridge at night.